Hi Farm Girls!!! 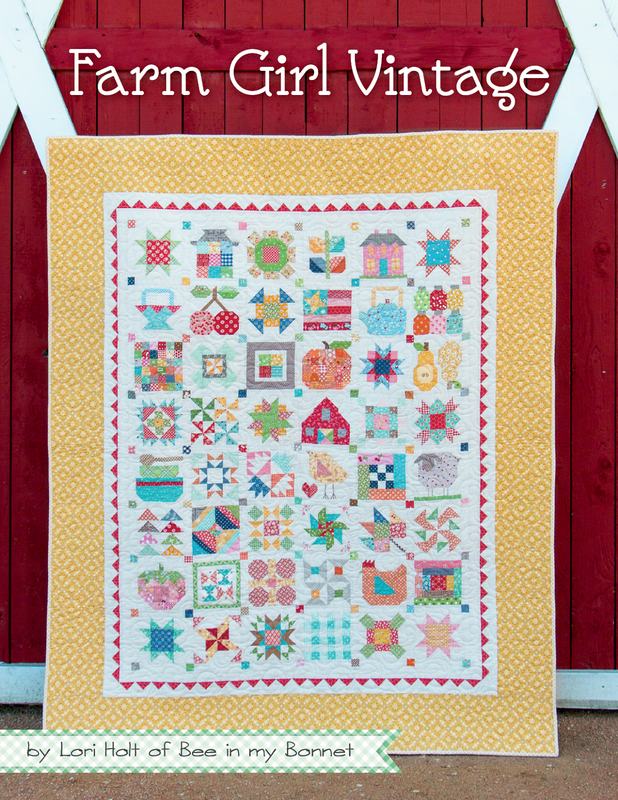 Thanks for stopping by my blog on the Farm Girl Vintage Sew Along hop! My name is Kelly and you may have heard of my One Hour Basket Pattern recently. I also co-write patterns with my friend, Ali, for Hearts & Bees. Fat Quarter shop sweetly sent me this book to try out and I have to tell you, I adore it! The book has 45 sampler blocks in two sizes (6" and 12") along with patterns for 10 quilts, 2 table runners, a table topper, and potholders! You can get a lot of milage out of this one book. There are so many cute combinations to make! The book was created by Lori Holt of Bee in My Bonnet and you can get your copy HERE. 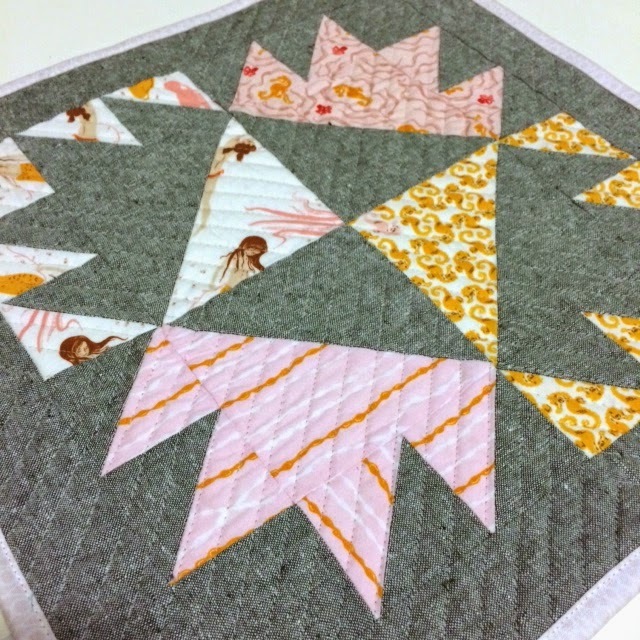 Lori is hosting a Sew Along on her blog and each Friday she posts a block from the book along with tips and inspiration! This is what happens when chickens swim! ha ha! 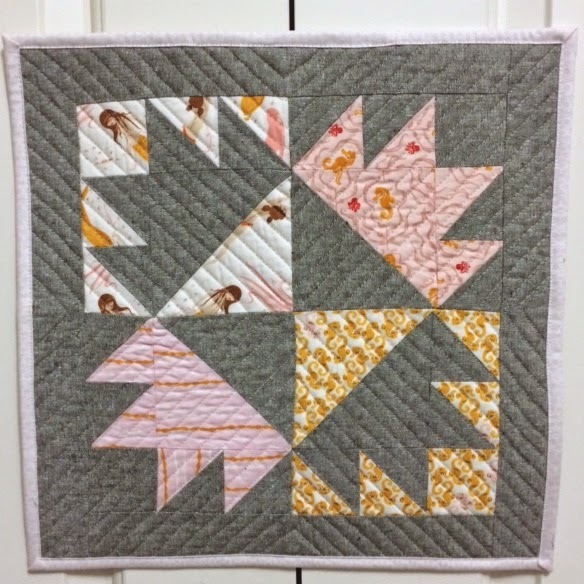 I made this Chicken Foot block, 12" size then quickly quilted it up to add to my mini quilt wall! Yes, I have a lot of minis. This is only about 1/3 of them! I have an addiction! 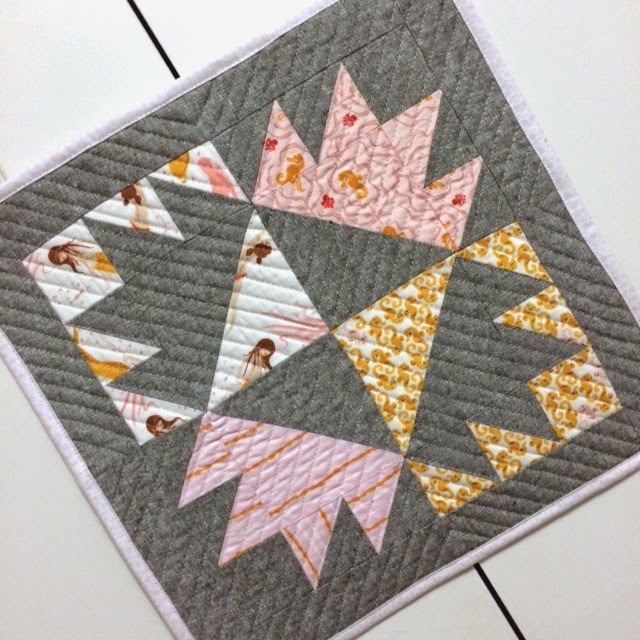 While I love Lori's style, it's not really "me" so I decided to see what would happen if I made one of the blocks with some of my favorite fabrics! I know you all were expecting Anna Maria Horner (and truth be told, I ALMOST used it), but I decided to bust out my Heather Ross Mendocino and some Essex linen blend in Olive. This is my first time using that color Essex and I really love it! I love the texture the Essex linen blend gives! Thanks for stopping by my blog! I really encourage you to try out some of these Farm Girl blocks and make them your own! MINIS! Duh! 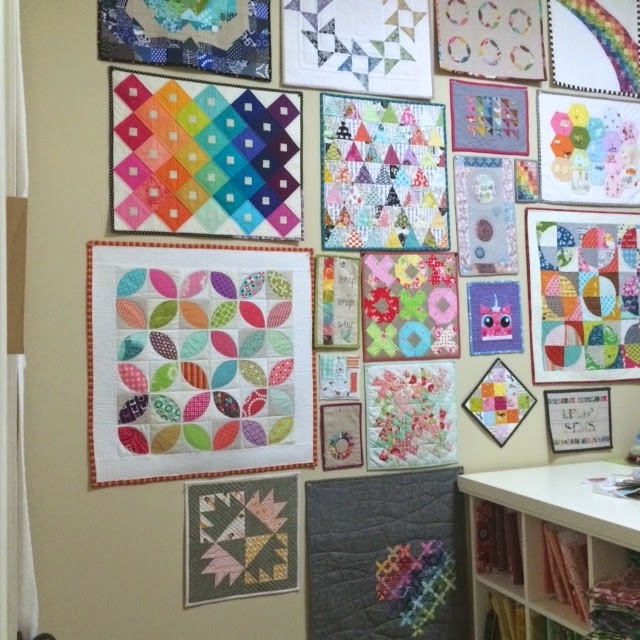 I have a million quilt ideas, but don't have time for full size quilts! MINIS! AND A WALL OF THEM! please excuse my caps and exclamation marks. this is just.... genius. i'm caught between a facepalm at the genius of it, and triumphant arms in the air! I love that you made the block with your own style.. it def encourages others. Yay for all diff kinds of fabric choices. Beautiful chicken foot! 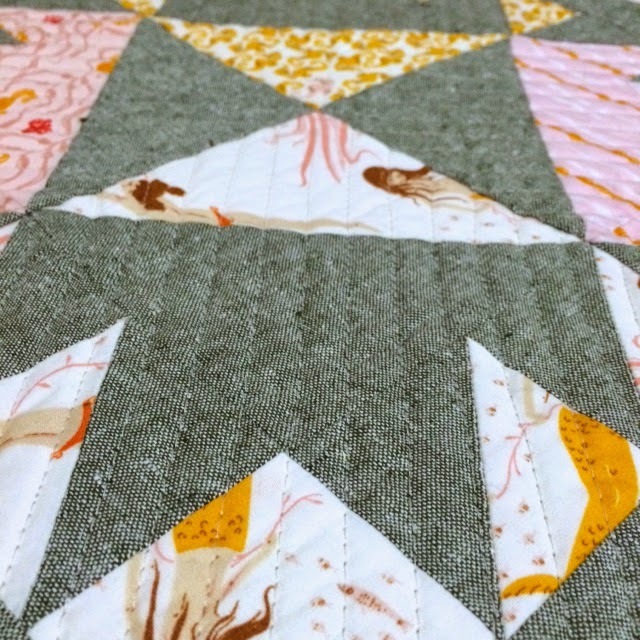 I love your gallery of mini quilts!